Not sure how many movies I will have the time to watch this weekend (we are going to be patching a couple leaks in the roof this weekend)... so thought I would put what I do get to watch in this thread. I saw this movie when it first came out on DVD. My sister-in-law brought over her copy for us to watch. And I enjoyed every minute of it. But I held off on buying a couple till I could get the 2-Disc version at a decent price. I finally picked it up yesterday for about $15. I popped it in first thing this morning. And I still enjoyed it a lot. It had a lot of great action, cool special effects... and a handful of laughs to top it off. Acclaimed screenwriters including David Goyer (Batman Begins) Josh Olson (A History of Violence) and Alan Burnett (Batman The Animated Series) join forces with revered animation filmmakers on six spellbinding chapters chronicling Batman’s transition from novice crimefighter to The Dark Knight. These globe-spanning adventures pit Batman against the fearsome Scarecrow, the freakish Killer Croc and the unerring marksman Deadshot. From some of the world's most visionary animators comes a thrilling depiction of Batman as man, myth and legend. What can I say... I really enjoy all the animated superhero movies. So when I saw this one cheap at Walmart yesterday I had to grab it... even though I have heard that this is not really that good of a movie. But I figured for such a cheap price I would give it a chance and find out for myself. I did however go into this one with very low expectations. Unfortunately even with the low expectations I was less then impressed. I can't really explain it... but I really didn't care for the style of animation used in this movie. I didn't care for the very beginning where the kids were sitting around telling stories of seeing Batman in action and thinking he was not human. And I found most the movie to be a bit confusing. It wasn't till the end of the movie. The final chapter with Deadshot that I really started to enjoy the movie. Of course by then the movie was all but over. Disney’s hilarious My Favorite Martian is an intergalactic comedy that crash-lands the classic television series into the nineties! This hilarious adventure begins when an ambitious TV reporter, Tim O’Hara (JEFF DANIELS), stumbles upon a Martian (CHRISTOPHER LLOYD) who has just crashed on Earth! Thinking this is the story of the millennium; Tim schemes to expose the Martian – who has taken human form as “Uncle Martin.” When Tim’s efforts are constantly foiled by Uncle Martin’s crazy antics, he decides to help the resourceful alien return home. With the government hot on their trail and a spaceship in pieces, can they blast Uncle Martin off in time? Wild special effects create outrageous laughs, including aliens morphing, cars shrinking, objects floating and Martin’s rowdy spacesuit, Zoot. Also starring Elizabeth Hurley (Austin Powers), Daryl Hannah (Splash) and Ray Walston (from the original "My Favorite Marian" television series), Disney’s My Favorite Martian keeps kids and parents entertained over and over again with its fast-pace action and nonstop laughs! I haven't watched this movie since I first bought 10 years ago. But that is probably because while enjoyable... this movie really isn't anything that special. Sure Christopher Lloyd was great as Uncle Martin... and there was a few laughs here and there... but other then that it is just a basic family movie. Are you saying it doesn't have nonstop laughs? Perhaps you should sue Disney for false advertising? Definitely not Non-Stop... and definitely not Hilarious! J.T. Neumeyer, a brilliant physics professor, receives a police file from the future with explicit detail of a gruesome murder - his own. Complete with photos and a list of suspects, the file indicates that the murder will take place in five days. When real-life events begins to mirror those in the report, the skeptical J.T. realizes the file is real and time is quickly running out. He has only days to solve the mystery of his own murder... and hopefully change his destiny. This is the 3rd time I watched this miniseries since I bought it. It is one that I have always enjoyed. 5ive Days to Midnight is an entertaining murder mystery with a little bit of sci-fi thrown in. I will admit that some of it is rather predictable... but that didn't take away from the enjoyment. Martin Scorsese's masterpiece Raging Bull ranks among the greatest cinematic achievements of all time. 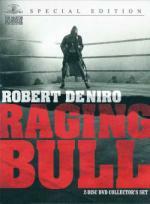 A searing story charting the rise and fall of middleweight champion Jake La Motta (Robert DeNiro), Raging Bull is "a superior achievement of film art" (Gene Siskel, Chicago Tribune). This is the first time I seen this movie... but I have always heard good things about it. I went into this one trying not to expect too much... though that is a little difficult at times with titles such as this one. And that may have effected my enjoyment of this movie. I found it an odd, but entertaining choice to make a movie made in 1980 Black & White. But that didn't take away from the movie for me. While it is a very good movie... it was a bit slow in portions... especially once he retired from the ring. And I would have liked to have seen more boxing in the movie. Instead this felt more like a story of his life outside the ring and the boxing not taking as much importance to the movie. But as I said... I did still enjoy it quite a bit and I am glad I now have it in my collection. 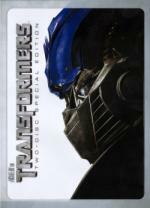 As for the DVD release... they really did this special edition up right. This release is loaded with extras... including 3 audio commentaries. I think all truly great films take a couple of runs to sink in. Citizen Kane, Vertigo, The Godfather, etc, all for me were merely very good. Something clicked on the second time and Raging Bull was the same. Thing is it would have been easy to string together more fights, but in fact the way he lived his life explains why he couldn't take the sport seriously, like when he took the beating from Sugar Ray just to say he didn't get knocked out. Has your edition got the jokes on, Pete? I was thinking that may be the case... and that I would enjoy it even more on a second viewing. I didn't go through all the features on the discs (2-disc set)... so not sure.. what do you mean by jokes... like a blooper reel? That is didn't see and DVDP don't list it. Oh... ok... I didn't see it... and not listed as an easter egg at least. Will have to check a few sites and see. Hercules and Iolaus take time out from Iolaus' wedding preparations, to help a distant village under attack from "monsters". When they reach their destination, they find the monsters are in fact Amazonian women who are controlled by Hera. I thought I would pop in one of the discs from mom's collection. I must admit I was a bit distracted... as most the time of watching it all I could think is this is her DVD. But I still enjoyed the movie. It has been a while since I watched it. A nice introduction to the main characters. This movie has Lucy Lawless in it though she does not play Xena. 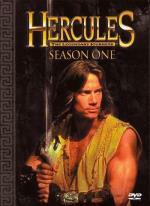 The second of five made-for-TV movies starring Kevin Sorbo as legendary muscleman Hercules, this one pits the title character against his most fearsome enemy--his own immortal stepmother, Hera. Using a number of disguises, the villainess does her best (or worst) to thwart Hercules in his search for the lost city of Troy. Before long, it is apparent that our hero is surrounded by nothing but enemies, save for the beautiful and mysterious Deineira (played by future Xena: Warrior Princess regular Renee O'Connor)--but can even she be trusted? Decided to watch this one when I got up this morning. I enjoyed it just as much as the first movie... if not maybe even a little more. It was weird seeing one without Iolaus... but I did like seeing Renee O'Connor in it... as she was always a favorite of mine in Xena. I am going to try to attempt some movies over the next few days... but not sure what I will be able to do so instead of doing a new thread I will just post here.